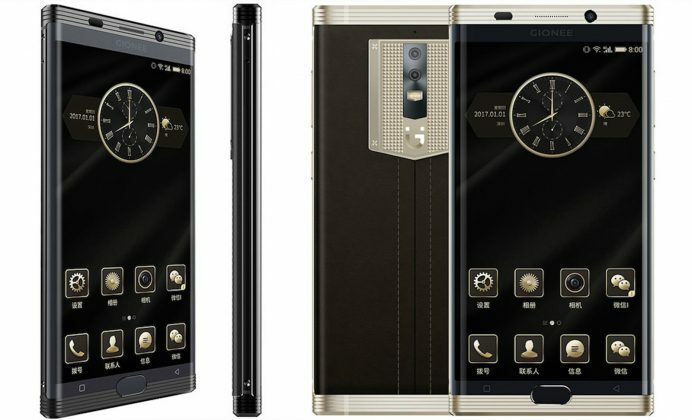 The Chinese smartphone market has officially welcomed the latest Gionee M2017 – a metal-and-leather luxury smartphone packed with powerful specs, including 6 GB of RAM and a huge 7,000 mAh battery capacity. The chief USP of this impressive smartphone is its massive battery power, which has been achieved through two battery units of 3,500 mAh each. It is believed that Gionee has managed to marry the two batteries and have them intelligently communicate with one another, similar to how a portable battery pack takes ‘charge’ once the main battery drains out. The 7,000 mAh battery boasts of its own smart power management system that Gionee claims can deliver almost 32 hours of talk time, up to 26 hours of non-stop video playback, and around 915+ hours of standby on a single charge. Qualcomm’s Quick Charge 3.0 facilitates fast charging, and the phone runs Android 6.0 Marshmallow out of the box, along with the company’s own Amigo OS 3.5 on top. The robust 5.7-inch Gionee M2017 packs a curved quad HD AMOLED screen, QHD resolution, sapphire glass protection and Adreno 510 graphics. It offers a minimum storage of 128 GB (expandable to 256 GB), dual SIM support, an 8-megapixel front camera and two rear cameras (12 MP and 13 MP) that promise a very impressive 2X optical zoom. A front-facing fingerprint scanner is yet another notable addition to the already splendid phone feature list. No headphone jack, No microSD slot, Use of a mid-range 64-bit octa-core Snapdragon 653 processor. On January 6th, 2017, the Gionee M2017 will officially go on sale in China. However, Gionee is yet to reveal details about the possibility and time of an international release. The Gionee M2017 is available in black and gold colour options, and comes in two editions. The starting price (standard model) is priced at RMB 6,999, roughly $1,007, for a 128 GB version. The luxurious 256 GB model sports an Italian custom alligator leather back, and its cost leaps straight to RMB 16,999, i.e. $2,446, slightly more than double of the lower version’s price.